A home’s primary value is usually based upon location. As everyone knows the closer to the sugar white beaches, the better the property’s value will be. Especially if it happens to be facing the emerald to deep blue waters of the gulf. Add to that a glowing sunset and you have prime property. In fact lot listings alone on the beach can many times start at $2,000,000 and range up to $5,000,000. If you find a spot that not only offers the emerald waters but the glowing sunset and it’s within your reach, why would you not make an investment? Properties along the Alabama Gulf Coast are some of the best values for your buck you can find. Not only does the beautiful scenery come along with the lower than most beachfront properties, the community is well worth the investment. Now if you had an opportunity to pay less than the above mentioned price to have that elusive and envied property, what would hold you back? Maybe you’ve not found the right place? That’s where our team come in. We have the expertise you are looking for to find the Right Spot! Take a look at one of our newest listings, Crystal Shores West. For far less than two million dollars, you can enjoy a breathtaking view and many, many more extras! 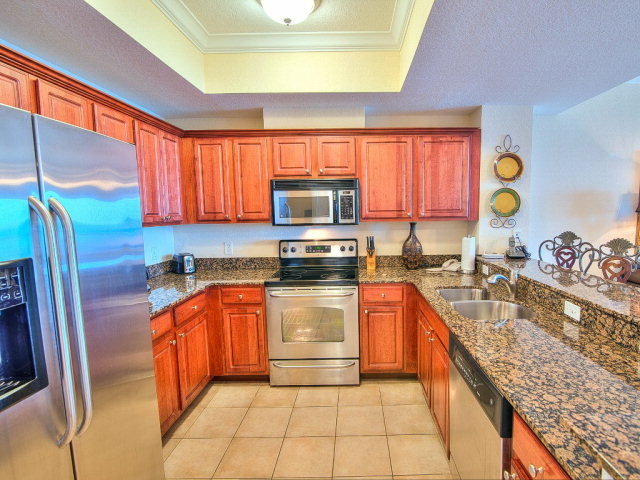 This two bedroom, two bathroom condo is on the 5th floor with stunning views of the gulf from a nice sized balcony. The complex itself offers a heated indoor/outdoor swim thru pool with hot tub, fitness center, sauna, and game room. This unit isn’t your Average Joe, with a spacious 1000 - 1199 living area. The on-site management is a huge plus offering a bit of security and ease. Renovations to the pool deck were recently done this year, with concrete paving bricks adding a textured look and extra safety. Located in prime West Beach, you're within walking distance to restaurants, such as Bills on the Beach, The Hangout, or Bahama Bobs. During festivals, you are in the heart of things. 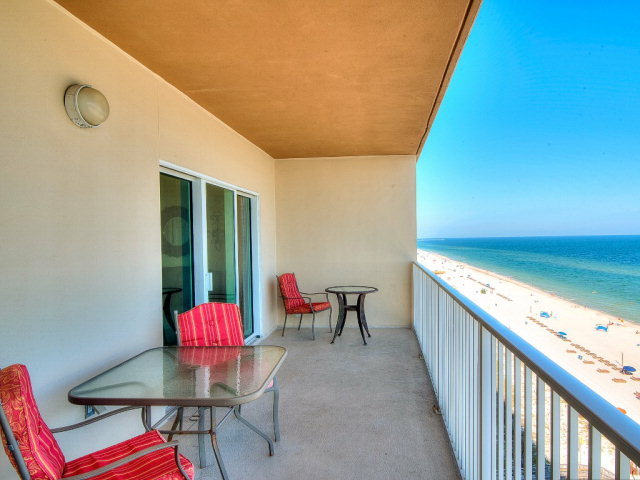 Only a short walk from the epicenter of festivities for Gulf Shores - you won’t miss a thing. Don’t feel like going out? Then grill your own burgers in the BBQ area. Order pizza and take in the nightlife view from your balcony. Or if you're the chef of the family, you are going to love this kitchen! The modern open kitchen features gleaming stainless steel appliances and a wrap around marble sided bar with a warm toned countertops. 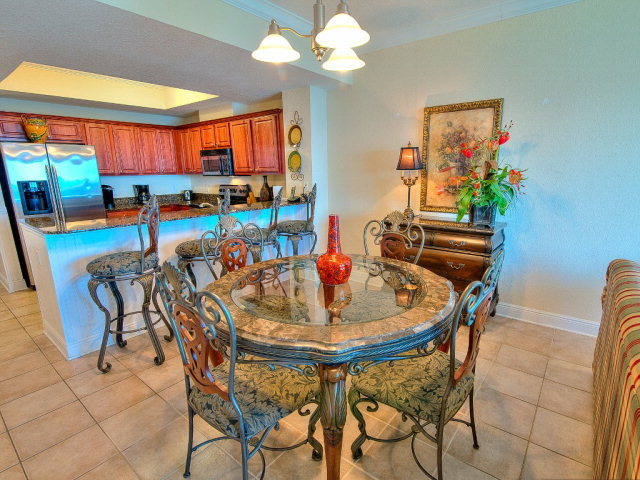 Enjoy your favorite drinks or appetizers around the glass topped table in the adjacent dining area. Stainless steel appliances and beautiful countertops with lots of cabinetry are there to store everything you need for a spectacular meal. No tiny spaces or cramped semi-cabinets with this kitchen. Want to take a spin to one of the many entertainment venues? Don’t worry about your vehicle being “too hot”. 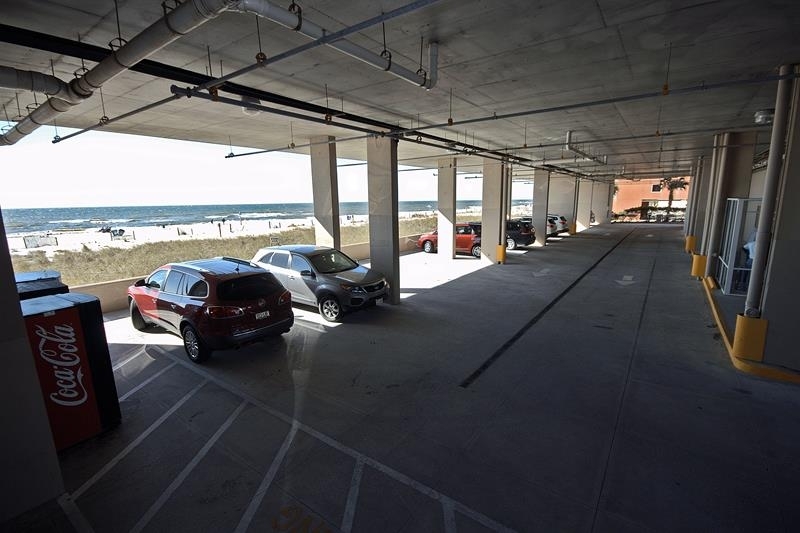 Covered parking makes things easy for you. Keep your vehicle cool and out of the weather. 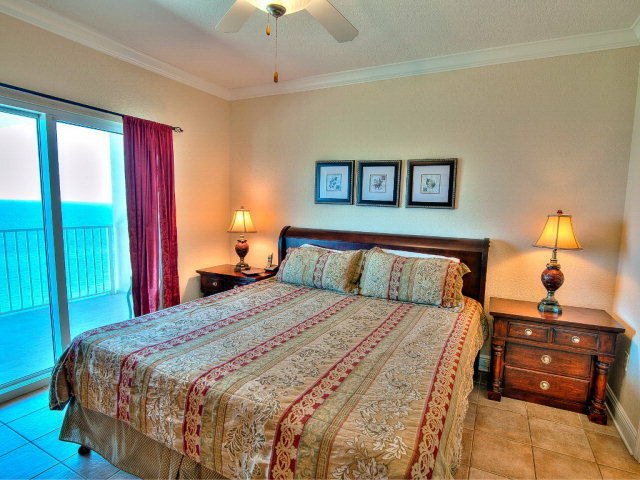 Bedrooms are comfortable and not the usual confined condo rooms you sometimes get. Each is tastefully decorated with furnishings you will be proud of. With two sets of double glass doors, you have easy access to the balcony with unobstructed views in both directions of the sugary shoreline along with a southern panorama that extends as far as you can see into the sparkling horizon. You are literally steps away from the beautiful beach and you will always hear the soothing surf sounds. 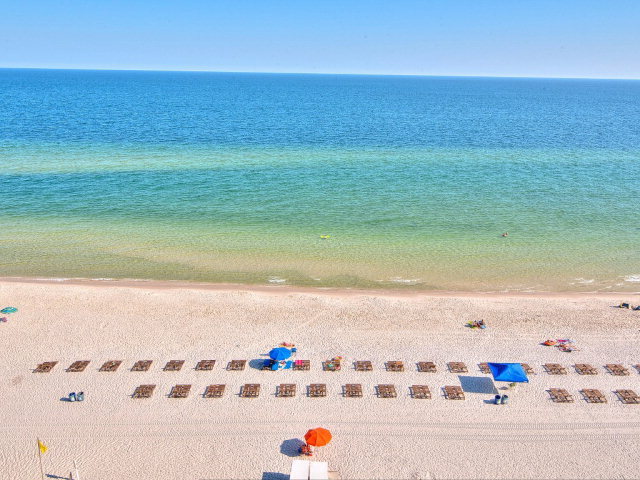 The property itself is located up front and center right on the gulf in a highly sought-after West Beach. 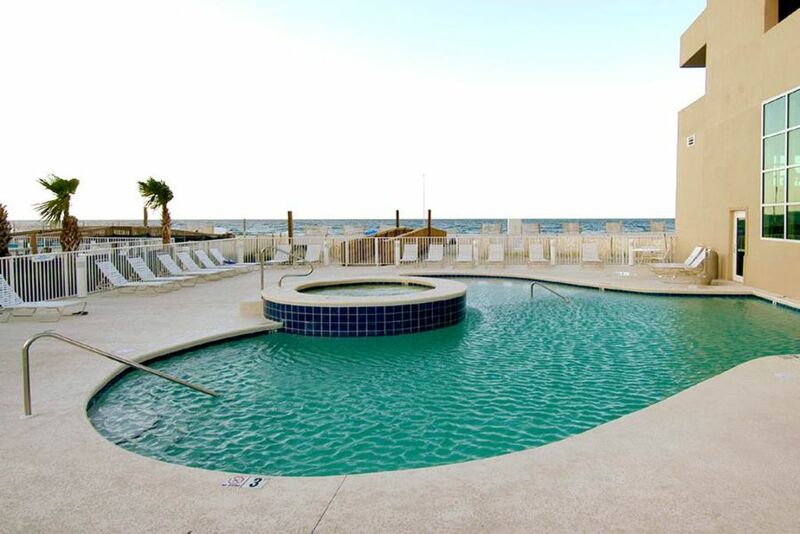 Located on 931 West Beach Boulevard, your dream of owning a beachfront property is waiting! Don’t let this one slip through your fingers. Give us a call today and take a look at this gorgeous condo! 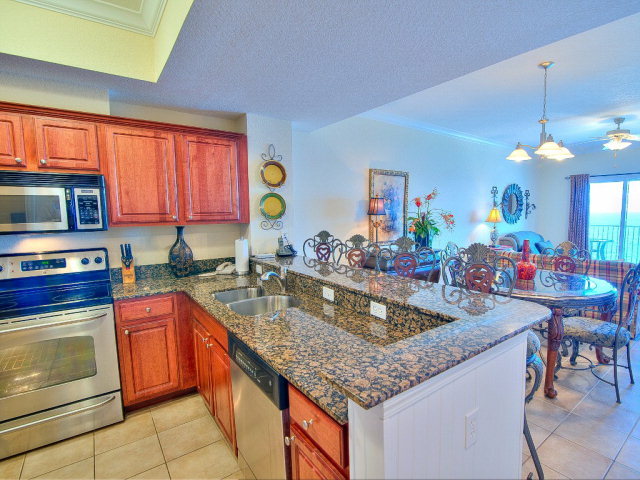 This condo is listed with our office offered at $419,000. 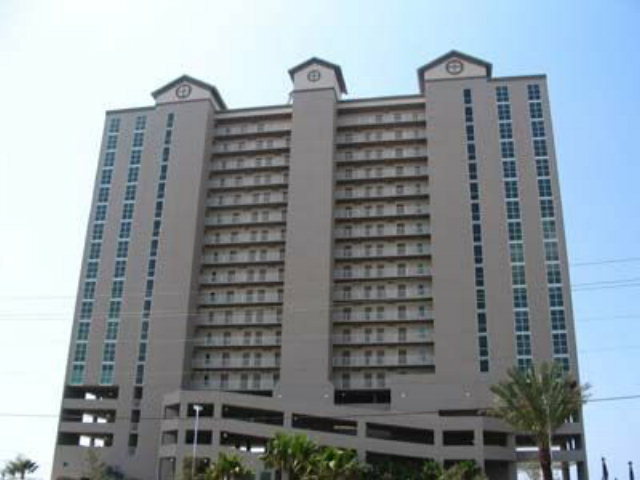 Call us today for more information and set an appointment to check out this classic beachfront condo for sale at (251) 968-7925. 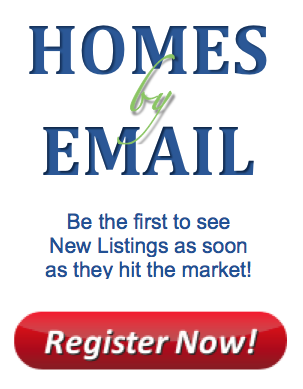 Take a look HERE at what else is listed in our area. Our staff of four very knowledgeable and experienced agents can assist you with any questions you may have.